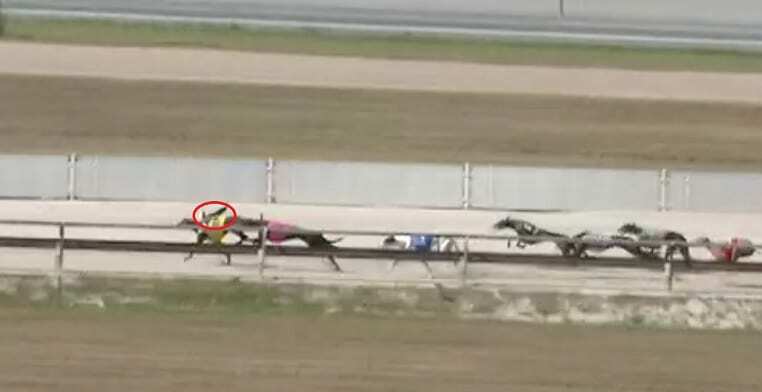 Lock ‘Em appeared to collide with a bird at Albion Park on Wednesday. IT seems every week the dishlickers are giving us new ways to get beaten and today’s opening event at Albion Park was no exception. Glenda Dart-trained first-starter Lock ‘Em opened as the $2.90 second favourite at online bookmaker BetEasy to make a winning debut but the punters weren’t keen on the son of Paw Licking before the jump, allowing him to get out to $4.60 from box five. Backers that jumped on after the drift would have been feeling very comfortable after the the lids opened when Lock ‘Em bounced out to an early lead ahead of the $2.50 favourite Banjo’s Issue, holding the pink rug out early in the piece. After taking a clear lead disaster struck for Lock ‘Em. What appeared to be a seagull smashed the leader right in the face, halting his momentum and allowing the favourite to take to the head of affairs. The race was never the same after the collision and Lock ‘Em did well to round out the placings behind Banjo’s Issue and the second placed Stylish Makeup ($2.20 at online bookmaker Sportsbet). Lock ‘Em’s ability to hit the line after the big setback impressed us however, and we’ve entered the Dart chaser straight into our blackbook.